There may be very few people those have not an eagerness of talking with mirror. There are so many peoples from us those like to spend their precious time in standing infront of a mirror specially in morning. But now eagerness of you of standing infront of mirror not only remains eagerness it will becomes your important need. Because now scientists are succeeded to invent such a mirror which can talk with you and can tell you useful things, even this magical mirror also give updates of whole day. Yes, New York Times Research and Development Laboratory makes such a magical mirror which knows you and can talk with you. This magical mirror is basically a very sensitive screen having Mircrosoft KINECT motion sensor. You just have to stand infront of it, it scans and save your image and details and also tell it to you. You can also see and check your health history and agenda with your image. This magical mirror almost can do everything which you need in morning. It can give you news, it can give you seasonal conditions, and can also set and arrange your calender and give you updates of all your main events. If you need or taking any medicine in morning it will give you complete with accurate amount of dose. And more this magical mirror also be remains in contact with your doctor and give him updates about you and medicine that which medicine is in under use or which medicine is near to be end, etc. 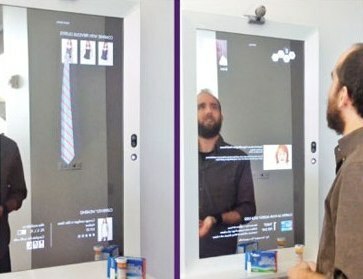 Even the camera of this magical mirror can also scan your look and give you recomendations related to your dressing. It can tell you which tie will be more matchable with your current weared suit. So whats your opinion about this magical mirror technology. ?